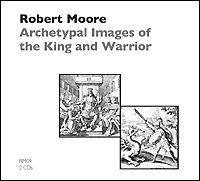 Robert Moore discusses both the constructive and destructive aspects of the masculine archetypal images and their relevance for contemporary male issues. Part of the course Ecco Homo: Issues in Male Psychology. In the wake of feminism, which raised as many questions about male identity as it did about female identity, there has been a growing interest in “masculinism”. Jung’s attention to the gender question reflected in his theory of archetypes, anima/animus phenomena, and ideas of individuation as a balance of traits within a self, provides a provocative medium for discussion of contemporary male issues. This course examines principal areas of focus within this emerging field of study and offers insights into the dilemmas of “being a man”. Suggested reading: Murray Stein, In Midlife; Grimm’s Tales for Young and Old, Ralph Manheim, trans. ; Robert Moore, “Healing the Masculine” (RM04) and “Rediscovering Masculine Potentials” (RM05); Robert Bly, “Men and the Wound” (audio).